Intelligent investors should be skeptical when reading about companies that could be the “next Berkshire Hathaway” or executives who resemble a “younger Warren Buffett”. The reality is that very few companies have even a remote chance of replicating Berkshire’s 20.8 percent compound annual gain in per-share market value over past 52 years. Furthermore, companies that meet or exceed that track record in the future will have to adapt to the conditions that prevail during their time. Mr. Buffett’s value investing principles are timeless but the application of those principles will not remain static. The idea that mimicking the style of Berkshire Hathaway’s website or shareholder communications brings one closer to achieving Mr. Buffett’s performance confuses style for substance. Markel Corporation has been discussed frequently on this website not because the company might be the “next Berkshire Hathaway” but because management has consistently adopted many of Mr. Buffett’s principles in substance while retaining their own unique style of operations. As the management team notes in the company’s recently released 2016 annual report, the long term record has been strong with compound annual growth in book value per share of 19 percent over the thirty years since the company’s initial public offering. Is Markel the “next Berkshire Hathaway”? We would not presume to know the answer, but should management be able to continue compounding book value at 19 percent over the next 22 years and maintains the current price-to-book ratio and share count, the company’s current $13.5 billion market capitalization would rise to over $600 billion. This is almost certainly far in excess of the results one can reasonably expect but falls into the category of an interesting thought experiment. 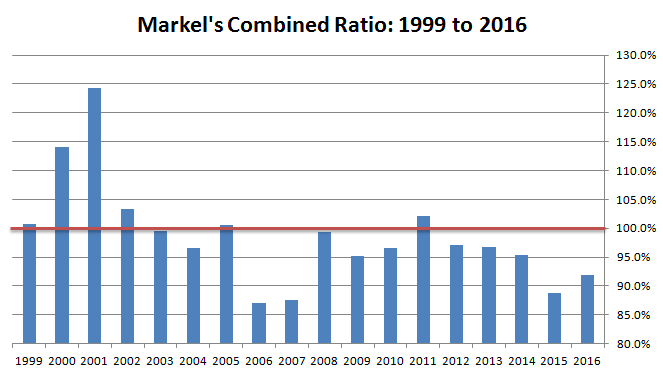 “While we necessarily break down our results in the normal pattern of yearly increments, we don’t think about Markel in annual terms. We think about your company in two distinct yet completely connected time horizons, namely forever and right now. Management seems committed to adapting to rapid changes, especially those brought about by technology, and doing so in a timely fashion rather than using the tired excuse of having a “long term outlook” to explain away short term deficiencies. With many companies, it seems like there are always short-term excuses for poor performance that tend to recur every year. However, a moderately long time horizon, such as five years, is obviously made up of a series of five one year periods. In order to produce good long term outcomes, managers have to show up every day with that goal in mind. Management characterizes the company as having three “engines of activity”: Insurance, Investments, and Industrials. Markel’s roots as an insurance company account for the first two engines. Insurance underwriting profitability is an essential ingredient for success and provides management with low or no-cost funds to invest in fixed income securities. Markel historically invested shareholders’ equity in common stocks but over the past decade has increasingly directed funds to majority or wholly controlled companies under the umbrella of Markel Ventures, characterized in the letter as “Industrials”. The early years on the chart show that no management team is immune from mistakes. Markel had some trouble initially with the acquisition of Terra Nova which impacted 2000 results and 2001 was impacted by adverse development that required an increase in reserves as well as the September 11 terrorist attacks. Since then, results have been much more consistently positive. Although the nature of insurance makes terrible results in some future year nearly inevitable, management has credibility when it comes to underwriting discipline. Credibility is important because sometimes negative results will be surprising as was the case recently with an $85 million reserve increase that will impact Q1 2017. Management is more confident that the 15.9 percent annualized five year reported return on the equity portfolio more accurately describes what Markel “earned” in terms of advances in the intrinsic value of the underlying companies. The passage of time tends to eliminate the differences between what is “earned” and what is “reported” – meaning that in the long run, changes in quoted values reflect underlying intrinsic value. This is identical in substance to Benjamin Graham’s analogy of the stock market being a voting machine in the short run but a weighing machine in the long run. “The rise in interest rates in 2016 means that our “reported” returns from the fixed income portfolio were lower than our economic returns from owning those securities. U.S. GAAP accounting recognizes that mark to market change of the fixed income portfolio but it doesn’t recognize that the net present value of our insurance liabilities decreased economically by a similar amount. “Markel Ventures continues to grow as a positive factor within your company. This collection of businesses provides a diversified stream of cash flow for Markel that is not tied completely to the economic fates or regulatory forces affecting our insurance operations. As such, these cash flows provide resiliency for the company as a whole and allow us more options to consider when we make capital allocation decisions. Of course, there is nothing to prevent management from highlighting these positive developments in the annual letters when warranted or providing more granularity in financial reporting. Currently, Markel Ventures subsidiaries are presented in a non-granular manner which could partly be due to a desire to conceal information from the competitors of individual subsidiaries but also makes it more difficult for shareholders to evaluate results. It is interesting that repurchases are listed as the last choice in the list, but perhaps not surprising given that Markel has not historically repurchased a meaningful number of shares. Repurchase activity in recent years seems more related to a desire to keep the share count constant as new shares are issued as part of the company’s stock incentive programs and has not varied much based on Markel’s valuation. As an example, Markel’s stock price traded at only a modest premium to book value for much of 2013 yet repurchases for the year were only $57 million, as compared to $51 million in 2016 when shares traded at a much more significant premium. 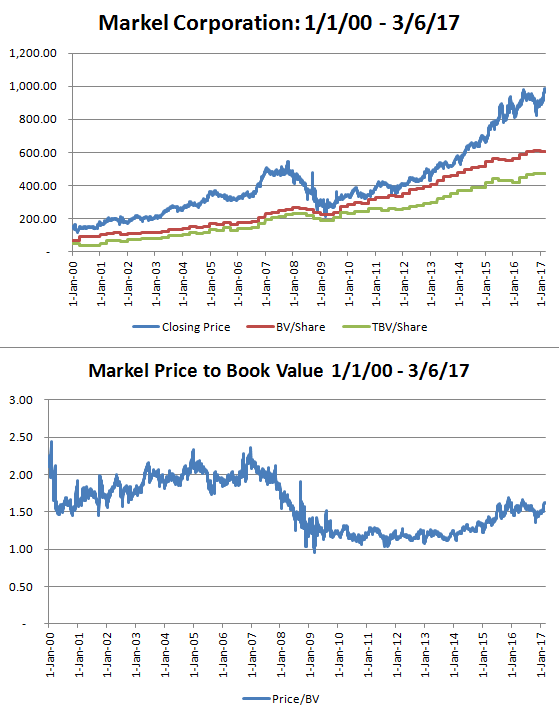 Overall, however, management should be evaluated based on progress in intrinsic value per share and Markel has posted good results in recent years with compound growth in book value per share of 11.5 percent over the past five years and 10.2 percent over the past decade. Management has reason to be confident in their ability to compound intrinsic value at satisfactory rates far into the future and shareholders seem willing to allow for retention of capital in order to fund that growth. As Markel’s stock price advances to near the psychologically meaningful (but substantively meaningless) $1,000 per share level, it is notable that the price-to-book ratio is only now reaching levels that prevailed before the financial crisis. Markel is still primarily an insurance company, albeit with a growing collection of non-insurance subsidiaries, so price-to-book remains a meaningful but understated measure of intrinsic value. The bottom line is that we have no way of knowing whether Markel is the “next Berkshire Hathaway” but the track record since the company’s IPO thirty years ago gives us reason to at least watch closely in the coming years. Substance matters much more than style. Markel’s management is very different from Berkshire’s in style but has adopted much of the substance that resulted in Berkshire’s unusual success.